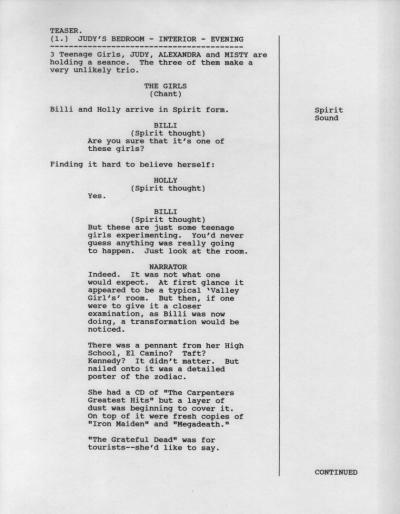 The first 11 episodes of The Soul Patrol were originally written for television. Episodes 12 & 13 were written for radio and then adapted for television. Fans of the series have wanted to know about the process and how the content was changed. The biggest question (and misconception) seems to be, did the shows suffer when being adapted for radio? I don't think so. It seems that radio is always going to be more difficult for a TV generation to listen to! A number of visitors have also wanted an example of a good script format to write their own radioplays and the steps to getting there. With these questions in mind we present below a brief example of how a story was affected by being written first for television then adapted for radio in a script format that the cast & crew thought worked best. Here are the story notes for episode 5, "My Camp." The original title was "What A Bummer." These notes are just a collection of ideas (in no particular order) of what could happen in the story. There's some dialogue, some action, ironic twists--but nothing set in concrete; just ideas. I have found that the longer I spend collecting appropriate, specific ideas for a story--the better that story will be. The longer I hold off writing a script, the better. Caution! Spoilers ahead! If you haven't heard episode 5 you may wish to skip the rest of this page! 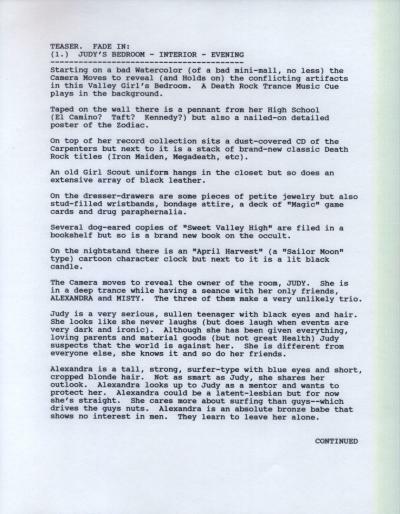 "My Camp" is about why Adolph Hitler is reincarnated as Judy, a Jewish Valley Girl. I came up with the idea from seeing pro-fascist groups wanting the return of a Hitler. Of course, the most ironic, dramatic and worst outcome (and the kind of irony that heaven would cherish) would be if the facists got their wish but Hitler was now the opposite of what they had wanted (a weak, unoppressed, Jewish, Valley Girl). 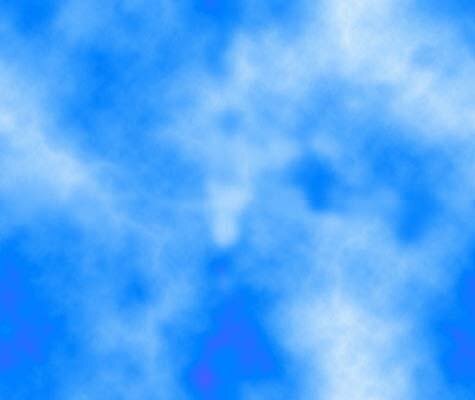 The story concerns their reaction and also why reincarnation is on a different dimension. We're not supposed to know the specifics about it and for good reason. 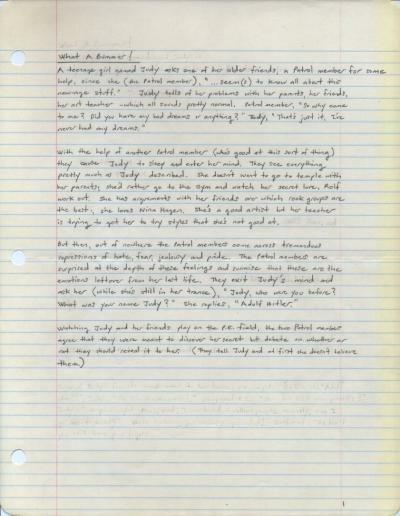 The original story notes cover how evil the main character Judy became. How she ended up acting like a Hitler, and how her parents were involved. I threw all of that out. It was boring and predictable and didn't truly reflect the possible purpose and outcome of reincarnation. Then I came across the idea about Hitler, the failed artist, and if he had been accepted into art school how history could have been very different. I had found an interesting way to tell the story and (bonus feature!) make a comment on art. After sketching out the plot a few times over a few weeks (figuring out the best way to plant dilemmas, realizations and then payoffs), I start writing the teleplay. Please note that you should never start writing a script without knowing how it's going to end AND at the same time, you must be prepared to change your preconceptions. One of the most enjoyable aspects of writing is making discoveries along the way and being open to going in a direction you hadn't expected. Technically speaking, the teleplay to this episode was different from most. The first page and a half was spent describing a room and the 3 main characters. Usually it's best to fly right into a story to get network executives on your side but this was a case where the set-up would add to the mystery and the tension--so I went with it. I enjoyed being able to reduce the plot to the standard 3 main characters: The protagonist, Judy, and the 2 opposing points-of-view espoused by her best friends, Alexandra (who would like Hitler) and Misty (who could end up being sent to death by a Hitler). And always follow the golden rule concerning teen stories: The fewer the adults, the better. Parents and other adults bring responsibility to the setting--reducing drama and comedy. Most of the adults in this story are neo-Nazis! On a later page there is a key scene with some of my favorite dialogue in the episode. It's comedic on the surface with irony running through it and my sarcastic viewpoint buried underneath. There's also another very unusual circumstance, where the final twist is clearly given away but almost no one ever notices it. (Did you?) It's when Judy clearly says that she never liked going to temple; therefore she's Jewish and so how can the neo-nazis reconcile that? It's scenes like these, that make writing and producing all worthwhile. When I wrote the teleplays I had no idea that one day I would be adapting them for radio. So, in another unique circumstance to this episode, I found that taking the descriptive part of the opening worked really well as narration. Please notice the format for the radio version--which is not the way they did it in the golden age. Radio scripts back then had audio cues on the left (because they often came first) with dialogue on the right. Pages were evenly split. But we were not performing these shows live. For our purposes I reversed the order and gave a lot more space for the dialogue. This resulted in being able to fit a lot more sheets of the script on the stands for the actors to perform from. We could get longer takes this way and as director I could insert isolated imitations of sound effects to help cue the actors. ©1995, 2014 David Koenigsberg. "The Cosmic Forces" and "The Soul Patrol" are trademarks of David Koenigsberg. This page was last modified on Tuesday, April 5, 2005.